Definition: Advocate can mean a person who speaks on behalf of another and is not necessarily legally trained, it also refers to someone who is an active supporter of a particular cause. MISTAKE ALERT! 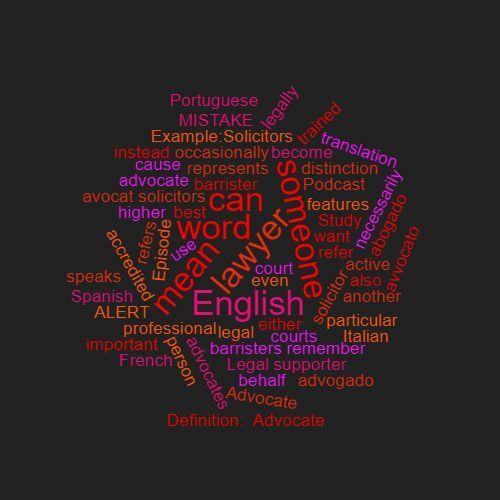 : Advocate is not a translation of avvocato (Italian) avocat (French) abogado (Spanish) advogado (Portuguese) instead these all mean ‘lawyer’ in English and it is important to remember the distinction in the UK between barristers and solicitors. If you want a word to refer to a legal professional who represents someone in court it is best to use either lawyer, barrister or occasionally solicitor and not ‘advocate’. Example:Solicitors can become accredited advocates even in the higher courts. This word features in Episode 44 of the Study Legal English Podcast.